To view a high resolution photo of the item please click the item thumbnail .. Please note that you MUST either turn off your "Pop-Up" blocker OR authorise this site. 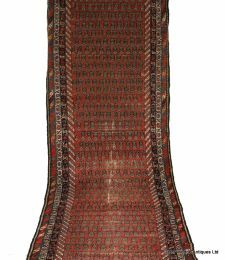 A Massive Contemporary Afghani Turkoman Red Ground Carpet With Rows Of Repeating Medallions, Multi-Stripe Border And Fringed Ends. 4600mm Long x 3350mm Wide. 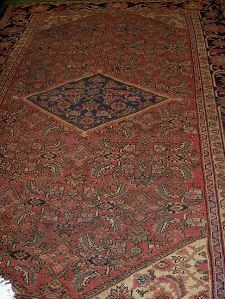 An Antique Persian Bakhtiari Rug With Floral Medallions On A Deep Red Ground. A Vintage Persian Bakhtiari Rug With Central Lotus On A Brick Red Ground, Blue Ground Spandrels And Ivory Ground Border. 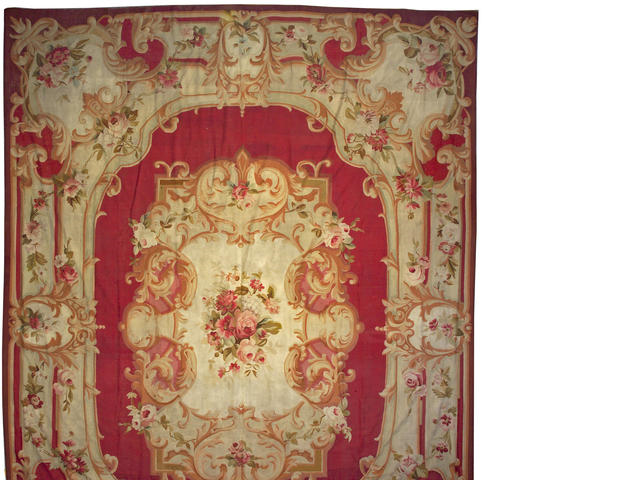 A Vintage Persian Meymeh Rug With Medallions On An Ivory Ground And Red Ground Border. 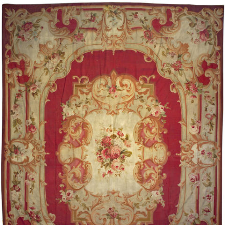 A Napoleon III Aubusson Carpet, The Central Stylized Cartouche Entwined By Flowering Vines And Enclosing Large Formal Bouquets Within Similarly Decorated Border. 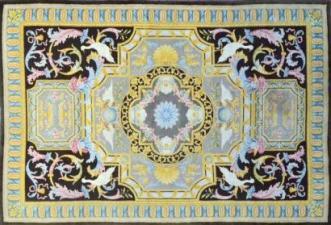 A Most Decorative Savonnerie Carpet With Central Flower Head Medallion, Black Ground Spandrels With Scrolling Foliage And Yellow And Blue Repeat Border. This Is An Extremely High Quality, High Pile Carpet In Excellent Condition. Purchased In Paris In Auction About A Year Ago. A 19thC Persian Carpet Border Fragment, Now A Wall Hanging, With Rust Ground And A Repeating Design Of Stylised Flower Heads; Cotton Salvage Fitted With Suspension Hooks. 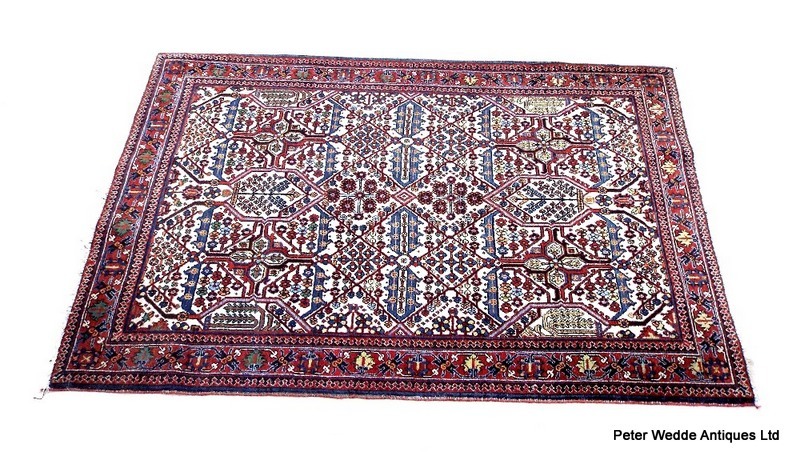 A Vintage Shirvan Rug, East Caucasus, Blue And Camel Ground With 3 Central Medallions. 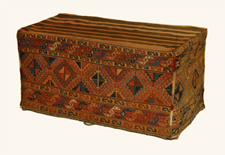 A Brilliant Antique Kurdish Large Kelim Saddlebag woven in shades of blue, orange and red with repeating triangular shape devices, the multi stripe border with hooked devices and the base with simple red and black stripes, now formed as a seat over a modern wood frame with padded top and casters. A Gorgeous Seat For The Bottom Of The Bed. An Extremely Decorative 19th Century Large Yellow Ground Embroidered Panel Decorated With Scrolling Foliage, A Peacock And Other Exotic Birds, The Border With A Mounted Horseman And Animals. 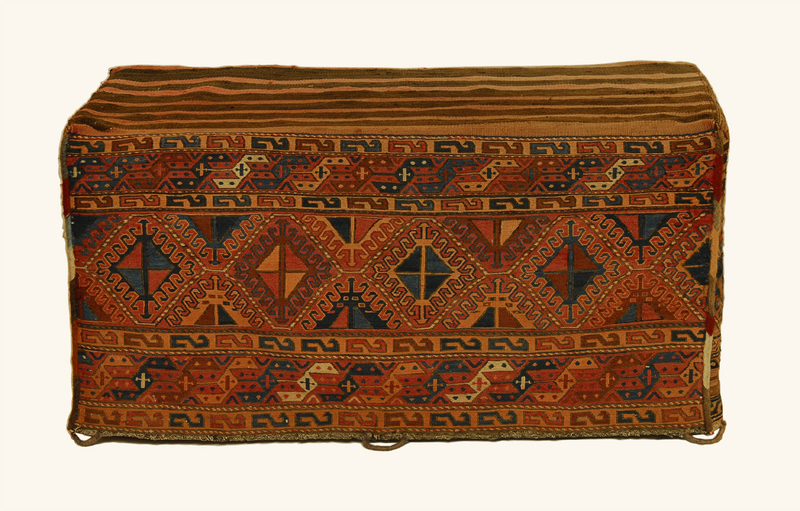 An Extremely Long Antique Tribal Runner, Karabakh, South West Caucusus, With Red Field, Repating Boteh Design, Blue Ground Spandrels And Multi Stripe Border. 1050mm Wide x 5800mm Long. A Little Low Here And There, No Holes Or Rips, Superb Colours, VERY LONG! 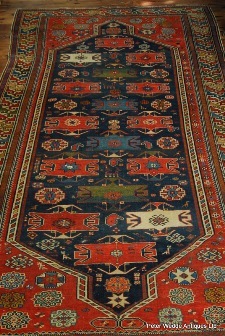 A Vintage Caucasian Rug With Various Coloured Medallions On A Pale Blue Ground. 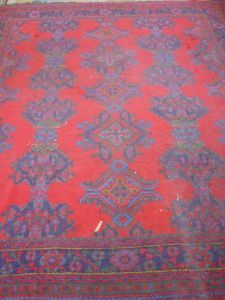 An Early 20th Century Mahal Carpet, north west Persia, with red ground, repeating medallion design and blue ground multi strip border. 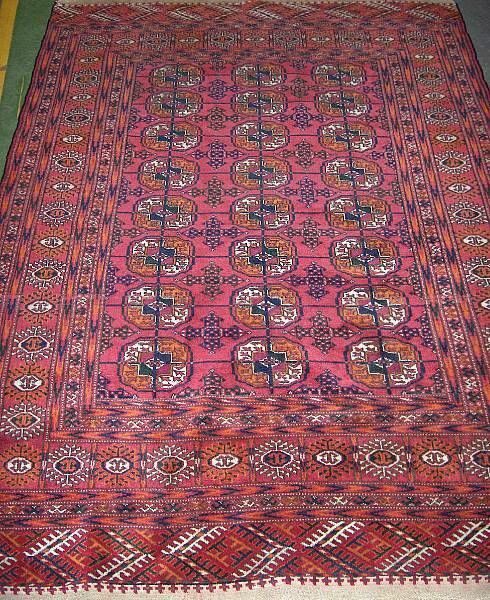 A Large Late 19thC Hamadan High Pile Carpet With Red Ground, 3 Blue Ground Medallions, Stylised Birds And Trees, Vari-Coloured Salvage, Mulit-Stripe Border And Fringed Ends. Excellent Condition, Nice High Pile With Little Wear, No Holes Rips Or Tears, Gorgeous Colours. A Snip At This Price. A Mahal Pink Ground Carpet With Single Blue Ground Medallion And Blue Ground Mulit Stripe Border. A Good Large Early 20thC Chinese Blue Ground Carpet With Small Central Medallion Featuring A Building, The Blue Ground With Scattered Birds And Butterflys, The Oat Meal Border With Vases Of Chrysanthemum And Blossom. 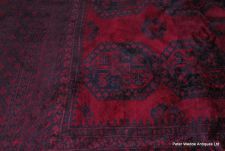 A Vintage Tekke Rug, West Turkestan, Typical Multi-Medallion Design On Pale Red Ground. 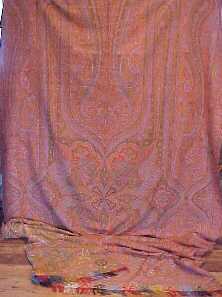 A Large Mid 20th Century Persian Pink Ground Carpet With A Tree Of Life Design And Multi Stripe Border. A top quality carpet in excellent condition. 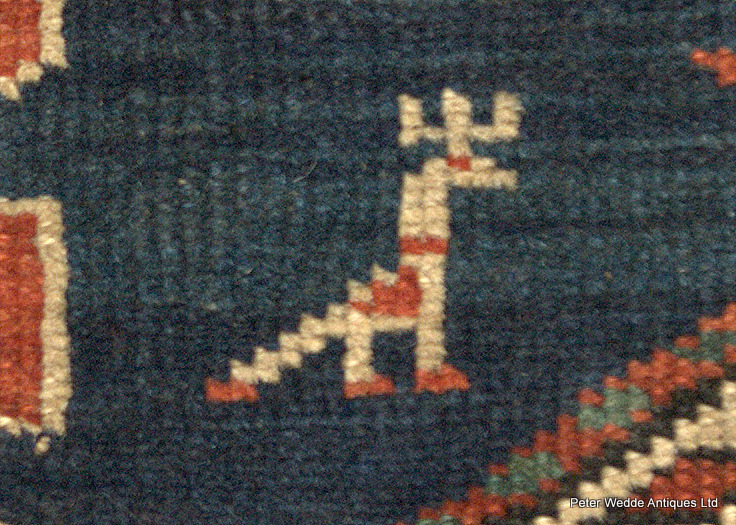 Please note you will need to make an appointment to view this carpet as it will not fit in the gallery. An Antique Shirvan rug With Blue Ground, 3 Medallions, And Blue Ground Border With Saw Tooth Design. 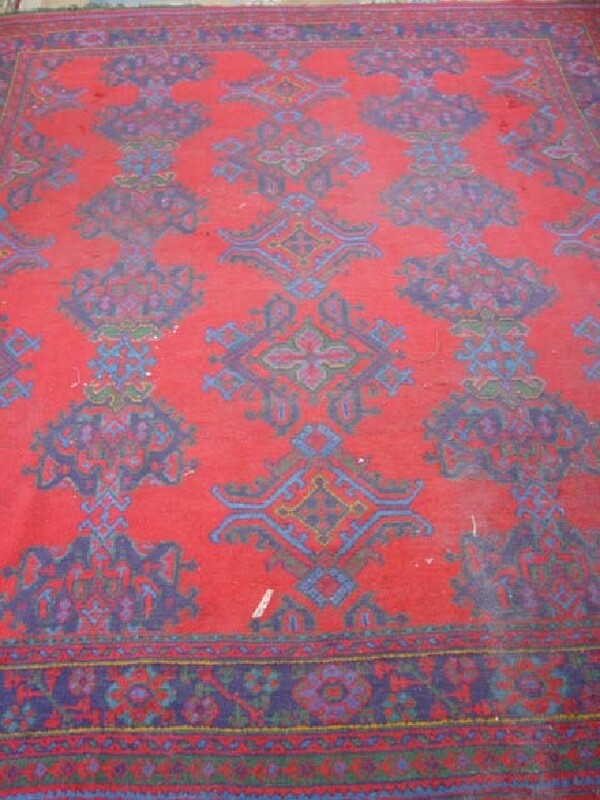 An Attractive Early 20th Century Heriz Red Ground Runner With Four Blue Ground Medallions And Multi Stripe Border. A Gorgeous 19thC Persian Rug With Blue Ground, Single Red Ground Medallion, 4 Lesser Medallions At The Spandrels, Multi-Stripe Border And Fringed Ends. A Chunk Out Of One Side And A Couple Holes To The Other, Good Pile, Fantastic Colours. A Good Bedroom Rug, With Some Thought The Ragged Edge Could Be Tucked Away Beneath A Piece Of Furniture Or Under A Bed. A 19thC Persian Rug Fragment With Red Ground And Stylised Flower Head Design. An Antique Caucasian Ivory Ground Runner With Repeating Multi Flower Head Design, Multi Stripe Border And Fringed Ends. Pretty Good Condition, The Fringed Ends A Little Uneven, Salvage A Bit Worn, Retaining High Pile With No Tears Or Holes. An Exquisite Pair Of 19thC Caucasian, Perhaps Shirvan, Rug Fragments Or Perhaps Bag Faces (Borders On All Four Sides) With Blue Grounds And All Over Design Of Rows Of Stylized Trees. The Borders Ragged, One With Low Pile To Part Of Field, Pile Quite Good, No Rips Tears Or Holes To Fields - Potentially A Very Lovely Pair Of Cushions. 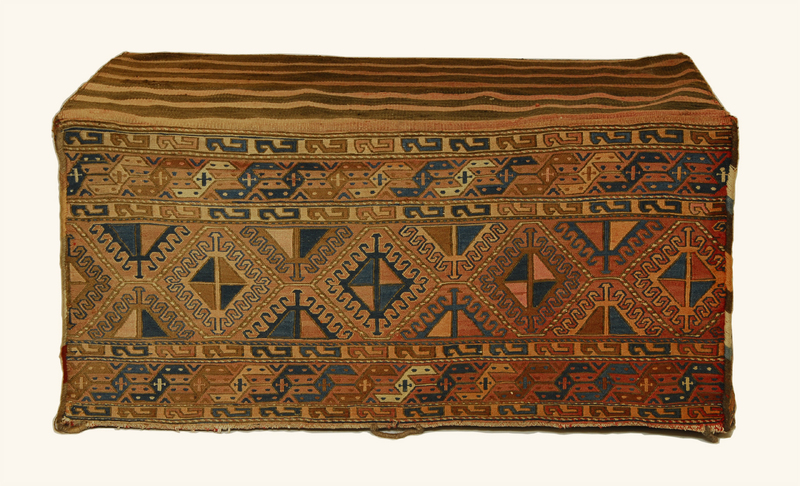 A 19thC Persian, Perhaps Shirvan, Rug Fragment With Blue Ground, 2 Rust Ground Medallions, Multi-Stripe Border And Fringed Ends. A Bit Low, No Rips Or Tears, Fabulous Colours. 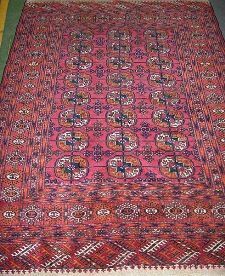 A Colourful Early 20thC North West Persia, Hamadan, Wide Runner With 5 Central Medallions And Multi Stripe Border. 3980mm Long x 1310mm Wide. Pretty good condition. Modestly priced! 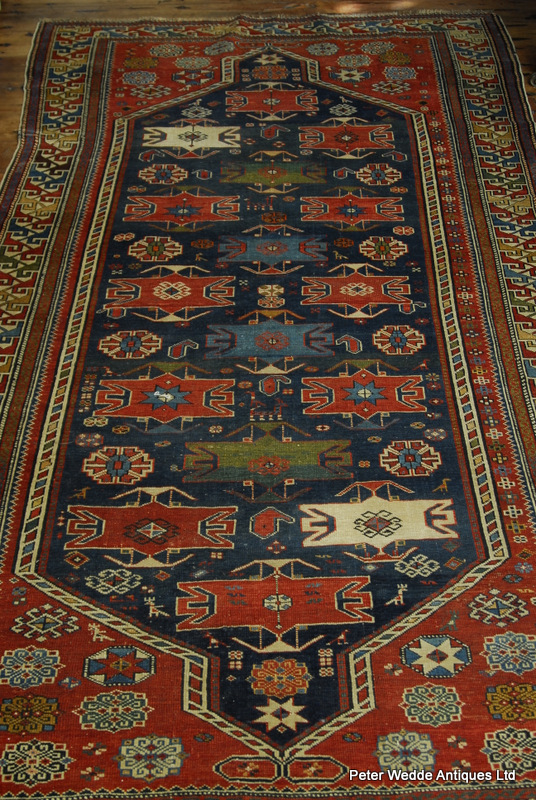 A large vintage Turkish, Ushak, red ground carpet with repeating medallion design in shades of blue and green. A most decorative and large high pile carpet. Look good in an informal sitting room. Not bad in a bedroom either. The Red Ground Spandrels With Small Medallions And The Ivory Ground Border With Interlocking Hooks. One End Border Slightly Reduced. 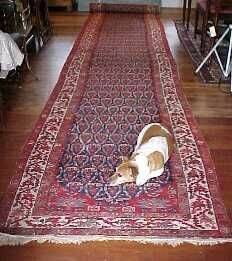 An extremely long semi antique Senneh runner. 7metres long x 1.07metres wide. 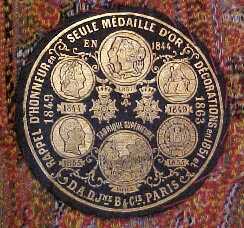 A large 19th century French Paisley shawl bearing exhibition gold medal label. Superb condition with one small repair. 3.4metres long x 1.65metres wide.